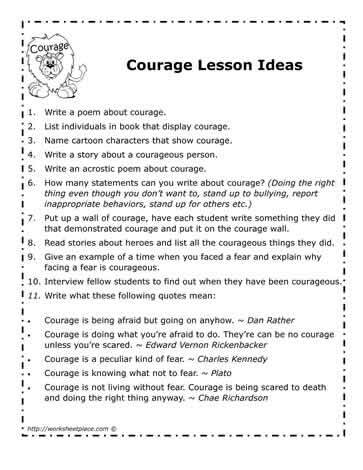 Courage is a character trait that is often focused on in school. I like to have students understand that it takes courage to do the right thing. All too often a student will see an inappropriate behavior happen and will not report it. Brainstorming sessions should take part in the classroom so that students feel comfortable doing the right thing even when they are afraid to. Provide students with a strategy to do the right thing. For instance, if a student know that another student is bullying or has been involved in theft. The student who is afraid to tell should be told he/she can excuse themself from the classroom stating they need to go to the washroom, they could then slip down to the office and report the offending behavior. Having the courage to do the right thing is a great focus for all grades. Support the trait of courage all year by identifying individuals who show courage.